Standing alongside a white wood-paneled, burgundy-bricked building, Tony Tyra looks through his dark shades at the congested 5 o’clock traffic moving along Dr. Martin Luther King Dr. Tony occasionally smirks and waves at motorcyclists that maneuver through the traffic, engines roaring and radios blaring. “I’ve been here all my life,” he says, folding his arms across his chest. Tyra’s younger brother sits on the stoop next to him. 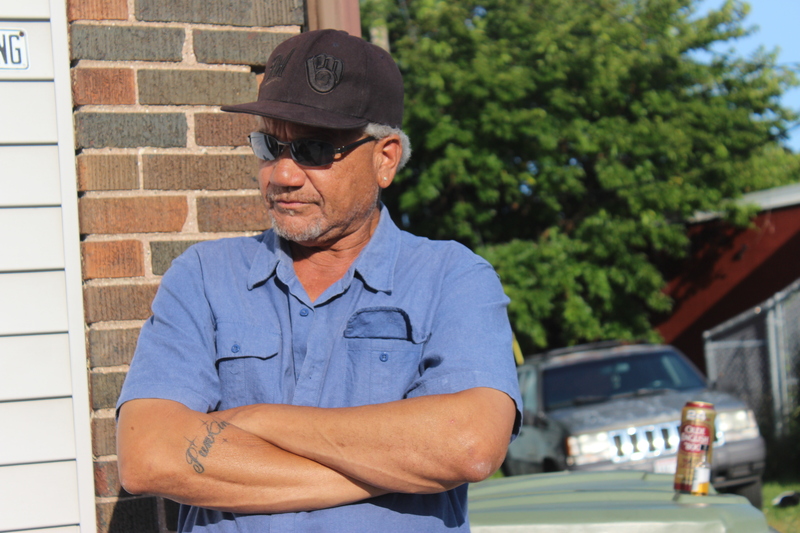 Tony has lived all over — Wauwatosa, West Allis, Port Washington — but he grew up on North Avenue, attending 20th Street School and graduating from North Division in 1978. Although he is the middle child to his two brothers, Tyra refers to himself as the big brother because of his height. He was also the one who took an outsized role in the house after his father died in a car crash when he was 10. A lot has changed since, he says. Back then, neighbors would discipline the neighborhood children as if they were their own; it felt like everyone was in it together. Tony did his best to avoid trouble. In middle school, he and his friends would protect the neighborhood from the gangs that started to form. He started working at 13, in the local grocery store. Tyra would work at a chemical company and, later, in aluminum diecasting. However, in 2008 he hurt his back on the job. This past election season, Tony dedicated his time to working with Wisconsin Voices to encourage people to vote and help at the polls. Now, at 57, he looks forward to watching his two children and seven grandchildren continue to grow. Tony hadn’t been one to settle down but, these days, he has his hopes set on finding a wife. It’s companionship he wants. Did you find value in this story? If so, please subscribe to our weekly email. Shana is a UW-Milwaukee graduate, multimedia journalist and spoken-word poet. She has previously reported for Media Milwaukee and collaborated with 371 Productions on the Precious Lives Series.